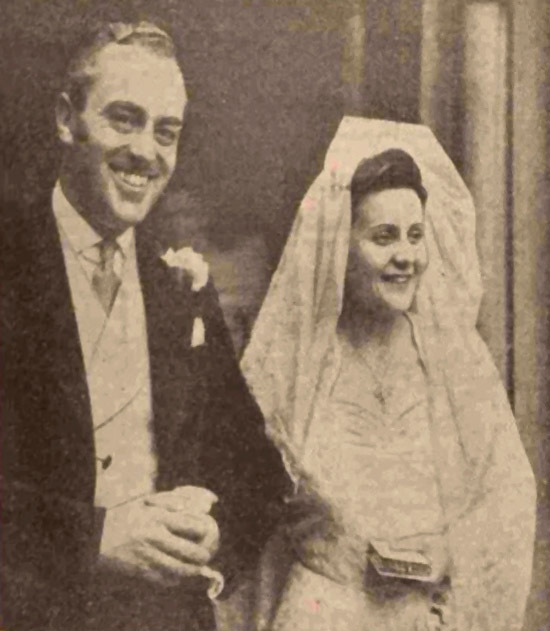 A picturesque gown was worn by Miss Margot Matthew, well known amateur operatic principal, when she was married in Dundee Parish Church (St Mary's), on Saturday. 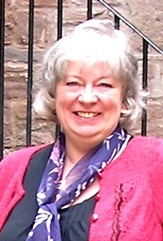 She is the eldest daughter of Mr and Mrs R. R. Matthew, 103 Magdalen Yard Road, Dundee, and her groom was Mr J. D. Gordon Cruickshank, only son of Mrs I. Cruickshank and the late Mr Alexander Cruickshank, Fochabers, 339 Blackness Road, Dundee. Miss Matthew, who is a member of Dundee and Carnoustie operatic societies, had chosen a gown with delicate pink foundation which gave a depth of tone to her toilette. A French gown, it was of guipure lace over pink tulle. Below the deeply-cut bodice the skirt had a princess opening to reveal a charming panel of snow-white and pink pleated tulle, and behind this the lace swept back to form a train. A long spray of apple blossom falling from the waistline emphasised the line of the skirt. From a headdress of French pearls was draped the veil of gossamer tulle richly embroidered with silver (lent by Mrs Legg, Loftus House). It was worn over the bride's face as she entered the church, and she carried an ivory-bound prayer book. Her bridesmaids, Miss Maisie Cruickshank, groom's sister, and Miss Mary Menzies, completed the old-world picture in bouffant dresses of mist blue net. Richly embroidered with rosebuds, they were swathed above the rucked bone corsages with pleated stoles of mist blue net. Their headdresses and bouquets were of pink roses. Best man was Mr Charles D. Anderson, and the ceremony was by Rev. George M’Gregor, Lochee East. Ushers were Messers Tom Matthew, John Black and Tom Gorrie. [S54] Website findmypast.co.uk (www.findmypast.co.uk) Passenger Lists TNA_BT27_1055_00_0050_P_0003F [Sep 2016]. [S54] Website findmypast.co.uk (www.findmypast.co.uk) British India Office Ecclesiastical Returns- Births & Baptisms Transcription URL of this page: http://search.findmypast.co.uk/record?id=bl%2fbind%2fb%2f612277 [Sep 2016]. [S54] Website findmypast.co.uk (www.findmypast.co.uk) Newspaper Dundee Courier 1949 Nov 9 [Sep 2016]. [S64] General Record Office for Scotland, unknown subject in "GROS Statutory Marriage", listserve message to Edinburgh, Scotland, unknown original date, GROS Statutory Marriages 1950 Dundee St Clement, ref 282/02 0329 no image held [Sep 2016]. [S54] Website findmypast.co.uk (www.findmypast.co.uk) Newspaper Dundee Courier 1950 Jun 5 [Sep 2016]. [S54] Website findmypast.co.uk (www.findmypast.co.uk) Newspaper Dundee Evening Telegraph 1950 Jun 5 [Sep 2016].